I have turned into the dog who won’t let go of the bone. To be honest though, there is still so much meat left on it, even for a vegetarian. It’s way beyond which scarf I will knit. The people on Knitting Paradise have spoken here: http://www.knittingparadise.com/t-199172-1.html and I accede to their opinion. In the meantime I have some sample knitting going on. First question posed: is this a fluke? 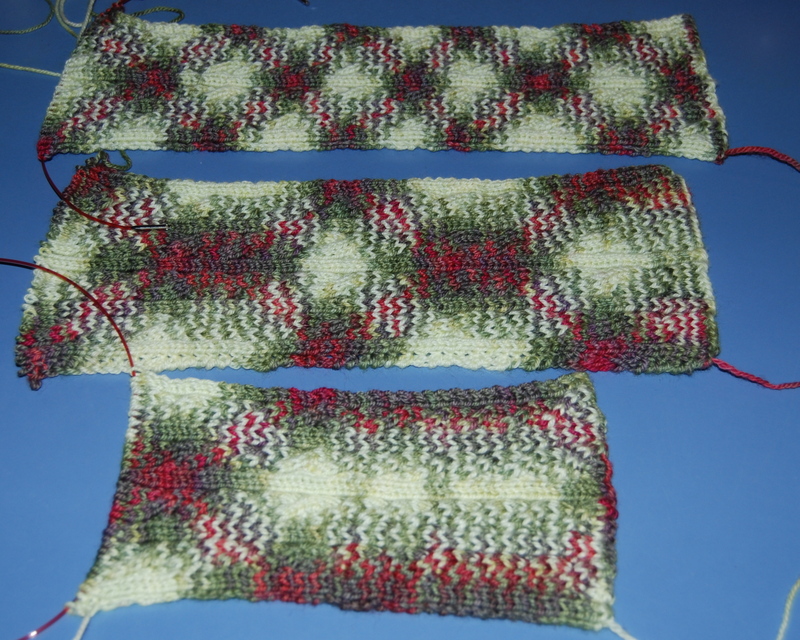 I started another scarf with a slightly different pattern. Needles used so far: US4. Cast on for the second sample in the irish hiking scarf pattern was 54. 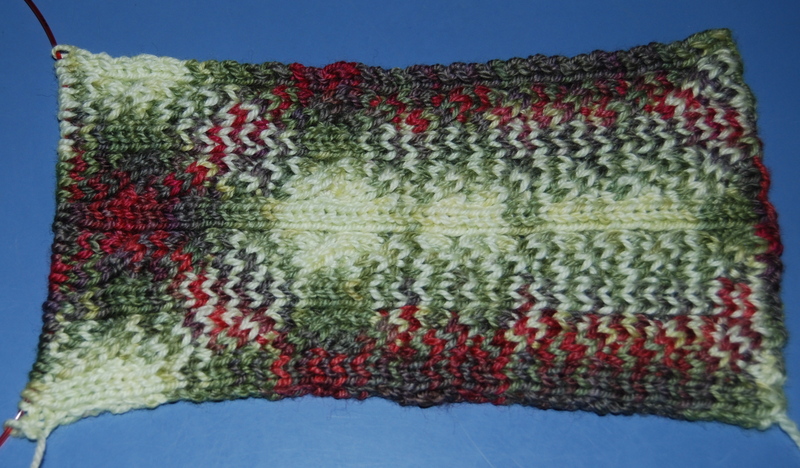 The original pattern asked for 42 with 3 cable repeats. Since I’m using sportmate from Lorna’s Laces I needed more width and opted for an extra cable pattern repeat. Either I’m jinxed or it’s the yarn working its mojo. Take a look at what I got. Top is the first try with 52 stitches in the palindrome pattern. Bottom the second sample as described above. And here is last night’s result. You see that the X or argyle or whatever you want to call it is really stretched out here. So much so that I had to give up knitting last night or forgo sleep. Use your imagination. Cast-ons from l to r: last try, second try, and original. Casting on the first two times shows a similar starting point. It’s slightly off. 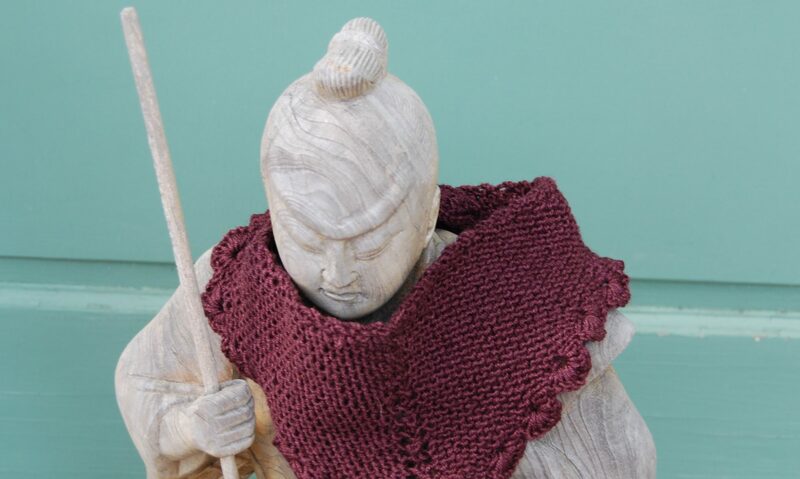 The pattern is 2 stitches wider and the knitting pattern is also slightly different. 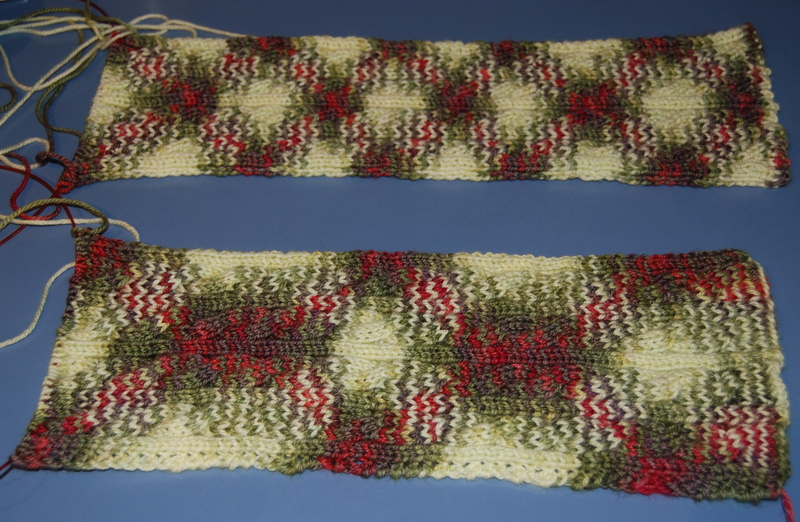 But I think there is a huge change in the pooling. One X is much bigger than the other. With the most recent try the X is really elongated. I attribute that to the color start change. Sure wish I would have paid more attention to math in school or whatever skill it takes to work this out without having to actually knit it all. I’m especially interested to see how this all knits up without a pattern but straight knit. This morning I decided to do some research and a whole new world opened up. I’m a baby in this yarn pool. Immediately joined the Pooled Knits group on Ravelry. And to show how behind the times I really am, check out Lorna’s Laces blog from 2011. Here you see someone’s scarf with a 54 stitch cast on without a pattern. And then check out all she has done by looking at her projects. It’s humbling. I’m not done researching and learning yet. At the moment I’m at a stage of overwhelm. I’ll leave for now with a last photo of all 3 tries.